Iowa played Ohio State this past weekend. It was a really good game until the 4th quarter and then the wheels slowly fell off the bus, so to speak. 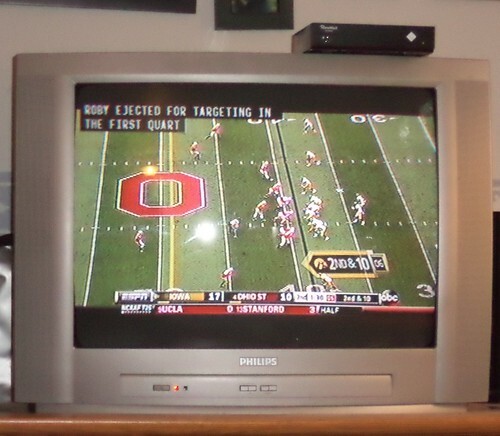 The best news out of the game was that I got to watch it, on my own TV. I purchased a new converter box to replace the one that died during the late spring. The salesman said these are getting hard to find because "everyone" is going to flat screen TVs which don't need a converter box. That's really nice, but I watch TV from September through New Year's and then maaaaayyybbbeeeeee, through March but the basketball team seems to be on free TV even less than the football team. That infrequent TV watching doesn't inspire me to purchase a flat screen. Eventually, I'll get one, but not right now. Normally, I stream the games on the computer. I can listen to the announcers while I do other things. I started listening to this game, but then the station cut out and up came the message that the game was not streamed due to TV restrictions. Okay, fine. That means I have to get the converter box up and running, which means I need to move the TV stand and clean behind it. In order to move the stand, I had to make some decisions about the myriad of boxes in the living room. For the first time in three iterations, I cut down a box a Macintosh computer came in. I know you're shocked, but it was just too big and they were not as interested in it as I expected them to be. Having accomplished all of this, I set about hooking up the converter box. There are a great number of assumptions made when one goes to hooking up these things. The biggest one is that the person doing the connecting understand what the acronyms are for each cable. The old box had color coded everything. This one had numbers and letters that meant nothing to me. I was so worried I was going to short the thing out. It took a couple tries but I, obviously, got it working. I can now watch Iowa lose to Ohio State. More importantly, our Sunday afternoons have become languid hours of lap time and napping. 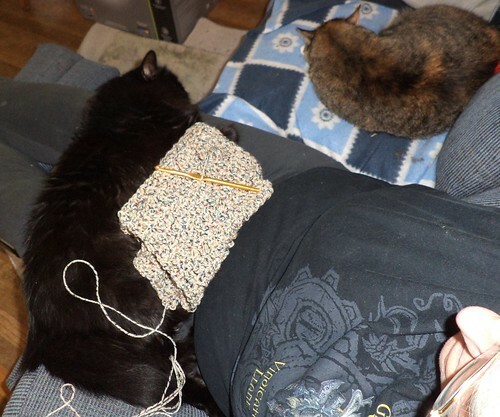 I "watch" bad Halloween movies while crocheting scarves and they sleep. Having the TV working again means I don't have to disturb a sleeping cat to watch something else.